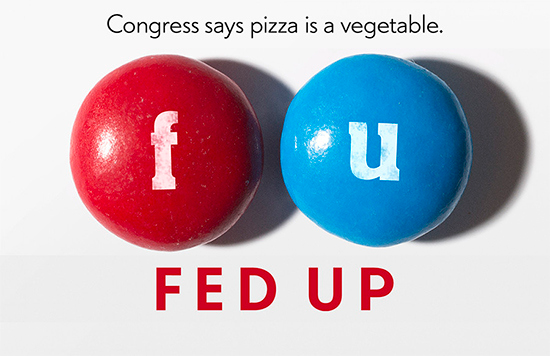 Fed Up is a movie that manages to present an enormous number of statistics in such an engaging way that you don’t realize to what extent you are learning and thinking through the whole 90 minutes. The subject of Fed Up is the obesity epidemic and the personal and devastating impact on several teenagers. Following their daily activities and hearing these kids’ frustration with their weight and their mostly fruitless efforts to lose weight brings a public health problem very effectively to the close and personal perspective. More kids are fat than ever before. They are getting fat at a younger age. Over their heads, politicians, parents, and other adults are pointing fingers in every direction, except where they should be pointing. Sugar. It’s in everything, at least in processed foods. It is the true culprit behind the obesity epidemic and the worst of our chronic diseases. In my book Choose Your Foods Like Your Life Depends on Them (2007), I drew the links between sugar consumption and diabetes, heart disease and cancer, both epidemiologically and biochemically. As a Naturopathic Medical Doctor, I have the medical training and experience to identify and treat these pathologies and to explain to my patients the mechanisms by which these develop. I wasn’t the first, and I won’t be the last to say that sugar is a public health disaster. Others with far bigger media attention have said the same. Whether it’s high fructose corn syrup, cane sugar, maple syrup, the artificial sweeteners, or even honey, sugar plays a huge role in the declining health of all age groups. Fed Up correctly points out that the addiction to sugar, fostered by the marketing of sugar to children has led to an intractable epidemic, which makes our society’s dalliance with tobacco look like a harmless caprice, a brief fling that we once indulged, in comparison. The financial might of the processed food industry towers over the power of the tobacco industry even at its peak. The lobbying money has meant that politicians of both sides of the political spectrum have been silenced on the subject of sugar. When a politician actually speaks out about sugar-laden processed foods, such as former NYC Mayor Michael Bloomberg or Sen Tom Harkin (D-IA), the industry whines about a nanny state “policing” our food, and that Americans are obese because we don’t exercise enough. That’s nonsense, say a wide range of scientists, such as Robert Lustig, MD, well-known for his “The Bitter Truth,” which received over 4 million views on YouTube. There is no way that we could exercise enough to burn all of the calories that we consume. What makes us fat is not the calories; it is the sugar. Excess sugar provokes a rush of insulin out of the pancreas. Because that amount of sugar is too much to be immediately used, it gets stored as fat. Fat is easier for the body to make and store, and that is how we put it in reserve. Whereas dietary fat has been the scapegoat and so has salt, “What if it’s all been a big fat lie?” as Gary Taubes wrote in 2002. He was also interviewed in Fed Up. Whatever one’s diet had been on entering the theater, and however strong the attraction to the candy bars displayed in the theater lobby afterward, it will no longer be a mindless act to choose to buy that candy or to keep walking past it toward the food actually recommended by the filmmakers: whole, natural food. Fed Up will make sure that our food choices rise from automated grabs to thoughtful consideration. Dr. Colleen Huber is a licensed Naturopathic Medical Doctor and Fellow of the Naturopathic Oncology Research Institute (NORI). She has an active natural cancer cancer clinic, where people come for treatment from all over the world because of her 90% success rate; the highest known cancer treatment success rate in the world. Dr. Huber graduated from and then taught at Southwest College of Naturopathic Medicine in Tempe. Her blog, https://natureworksbest.com//blog, contains articles about cancer, alternative cancer treatments, nutrition, and natural lifestyles. Many of these articles have appeared on www.mercola.com, the world’s most visited natural health website. Dr. Huber’s book, Choose Your Foods Like Your Life Depends On Them, has been featured on four Arizona TV appearances and she has been featured most recently in the book, Defeat Cancer: 15 Doctors of Integrative & Naturopathic Medicine Tell You How. Her groundbreaking and successful alternative cancer treatments and cancer prevention diet have been covered on Channel 3 and Channel 5 in Phoenix. Her academic writing and original research on sugar & cancer has appeared in The Lancet and other medical journals, and received media coverage around the U.S. and Europe. Dr. Huber is one of very few naturopathic physicians/naturopathic oncologists in the United States to have been granted hospital privileges with full scope of practice as licensed in the State of Arizona.